Available 6, 8, 10, 12, 14, 16, 18, & 20 BUSHEL. These streamlined and durable poly trucks are molded in one piece with 1/8" thick crack-resistant material. They are super strong and the smooth rounded corners make cleaning a snap. Body is mounted on a strong galvanized steel base. Rugged 4" casters provide smooth rolling. Widest selection of sizes and a 0.225â€� thick. Coupled with a new 1-1/4â€� thick double wall, heavy-duty poly base for extra support, these trucks are designed to offer years of trouble-free service. Compare our prices. You get more and pay less with these trucks. 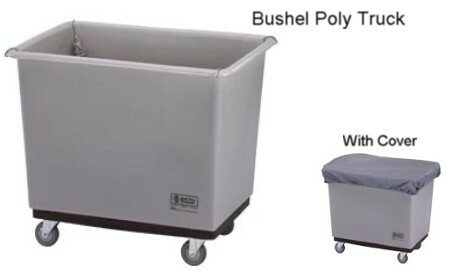 This product has never been more versatile with applications in laundry, housekeeping, or though material handling conditions. The best value in the industry.